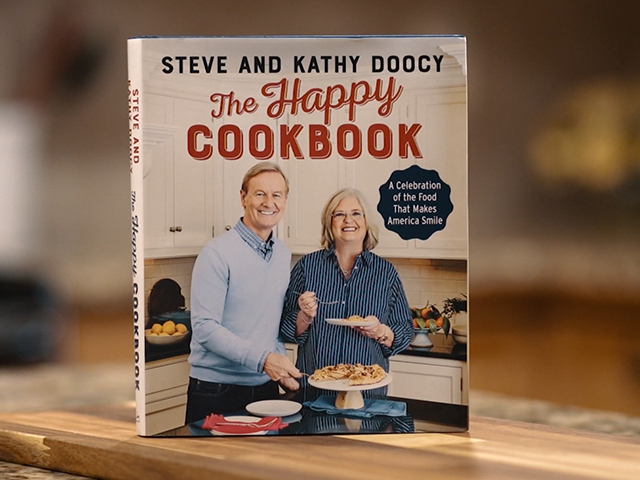 “Fox and Friends” host author Steve Doocy and his wife, Kathy, are known for their light-hearted take on family life. They reminisce about some of their favorite memories--and recipes-- in their new book, The Happy Cookbook. Fond memories and good times are the main ingredients for these recipes, but the inspiration for the book came from something far more serious. In late 2015, Kathy went for a routine eye exam and was diagnosed with ocular melanoma, a rare form of eye cancer. “And we decided we would put together our family recipe favorites and those of some of our friends and neighbors and some famous people we know, and that's where The Happy Cookbook came from. It's just a celebration of the recipes that make America smile,” says Steve. The Doocys say that when it comes down to it, it’s about more than just the food; it’s about the stories go with it. “Whenever I think about our wedding reception, I think about a cake. But what happened to the cake?” Steve asks. ‘“Well, my mom said, ‘I'm gonna bring you the cake,’ from Abilene, Kansas. And we were getting married in Kansas City. And so, it never dawned on my parents, you know, a beautiful three-layer cake, in the trunk of a car, driving across Kansas when it's over 100 degrees. Steve and Kathy’s new cookbook celebrates those memories and gives others the chance to make new ones.